Soundwise, it’s quite easy to appreciate the sound of a fuzz pedal. Over-saturated, aggressive compression, very rich in harmonics and sustain that can go to infinite and beyond if the pots are all the way to the right. But when talking about overdrives and distortions, it’s becoming more complex : a cranked up overdrive is very similar to a subtle distortion. Some says it’s about heat or harshness in the sound (mellow and warm for an OD vs cold and gritty for a distortion). But it’s mostly subjective and representative of what you’re hearing, and therefore giving a universal definition is hard. Then what are the real differences? On which aspects each effect is unique? In this review we’re gonna firstly, check and analyse in depth the structures of a few circuits which gather the main conception technologies for OD, distortion and fuzz. And then we’re going to make a signal study, to understand how this wonderful littles boxes affect the sound! – Clipping : talking about sound signals, it is the flattening phenomenon on the submit of it. 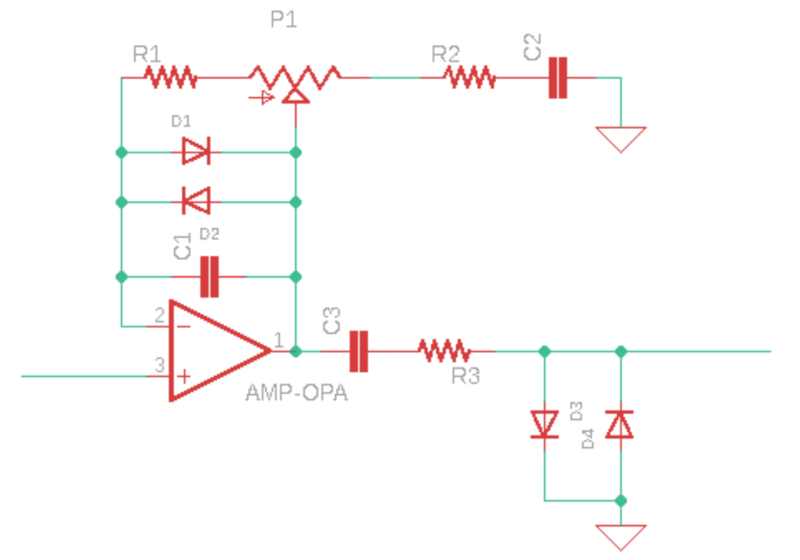 – OP-Amp (operational amplifier): as it’s supposed in the name, the OP-Amp is an electronic device that amplifies the signal considering its inputs voltage levels. – Harmonics : when you’re playing a note on your favorite instrument, the signal is not only compound of one frequency. There is the fundamental (the note you played) and other frequencies, which are the harmonics. These harmonics are multiples of the fundamental, and it is their presence and ratio to each others that give the unique timbre to an instrument. – High-pass/low-pass filter: thanks to particular mountings, you can choose whether to cut, amplify, or both, the influence of frequencies in your signal. The main feature of the high pass is to attenuate the low frequencies, and conversely. 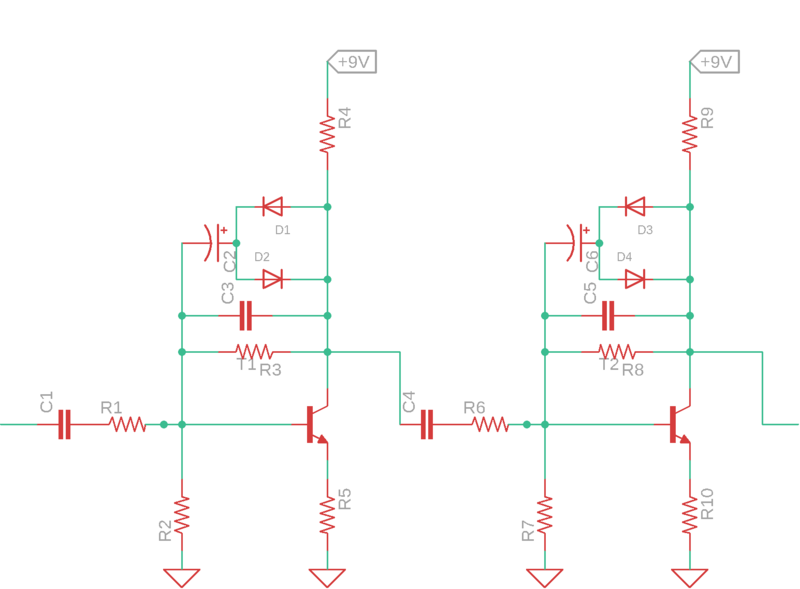 – Cutoff frequency: this notion is related to the filters, it is the frequency from which the filter will start attenuating. – DC component: by definition it’s opposed to the alternative signal which is the one produced by the guitar. Your pedals are powered with 9V batteries whereas 220V – 50Hz main power is a 50Hz sinusoid signal, so an alternative one. – Fourier transform: it’s used in signal studies to analysis multi-frequencies signal. It allows to point out the frequencies in the signal and their amplitude. It’s their settings, adjustments and superposition that will give them their individual tone. So, this schematic represents the gain stage of an od/distortion pedal as generic as possible. To visualize and understand better how they differ from each other, we’re gonna use a few classic pedals as demonstrations/examples. If you want to get a look at these schematics, you can find them on the internet. Just for fun, type Tube Screamer schematic on your favorite web browser! Using this structure, the easiest way to diminish or augment the saturation brought by your pedal, is to stack this stage. The more stages, the more amplification, saturation and clipping. The very well-known TS808 by Ibanez has only one gain stage, the BE-OD by Friedman has 4 ! and now put a fifth, or even a sixth stage so you would get a powerful Fuzztortion, like the Bitoun Fuzz ! you get a first idea of what it does to the sound. Next step to saturation is the clipping, which is produced by the diodes. The first way is to place them on the feedback loop of the op-amp (soft-clipping). Most of the time, the diodes have a threshold voltage of 0.7V, that can’t be topped. Guitar signal is about 20mV, the gain brought by the op-amp is around x100, so every bit of the signal beyond the diode’s threshold (0.6V to 2V) gets flattened to it ! While in the temporal domain the signal is clipped, in the frequential domain it gets charged in harmonics. That’s where the magic happens ! In this configuration, the amplification and clipping stages are not connected. The signal is clipped regardless of the op-amp operation. The influence on the sound is very perceptible. It often brings a compression feeling on distortion pedals. Needless to say that the choice of the diodes (leds, germanium, silicon), the parity (symmetric/asymmetric) and the quantity (up to 3) has an effect. They have different threshold voltage, which affects the signal. Also, don’t misassociate soft clipping to overdrives and hard clipping to distortions talking about denominations. You can find OD using hard clipping and conversely. Finally, the heart of the amplification stage, the most interesting part! The gain of an amp is established by its technical characteristics, or the datasheet for you little engineers reading right now, and by the ratio of impedances Z1 and Z2 in the feedback loop. To this point, we can already notice major differences between the OD and the distortions : the TS808 has a max gain (on a specific frequency) of 41dB, or 112 times the initial amplitude of the signal. Not bad would you say tell me? Nothing compared to the 61.5dB (x1200) of the DS-1, and the 67dB of the Proco Rat (x2305!!). But where it’s getting really interesting, is that the gain is not the same for all the frequencies in your signal, and this thanks to the capacitors in the circuit. 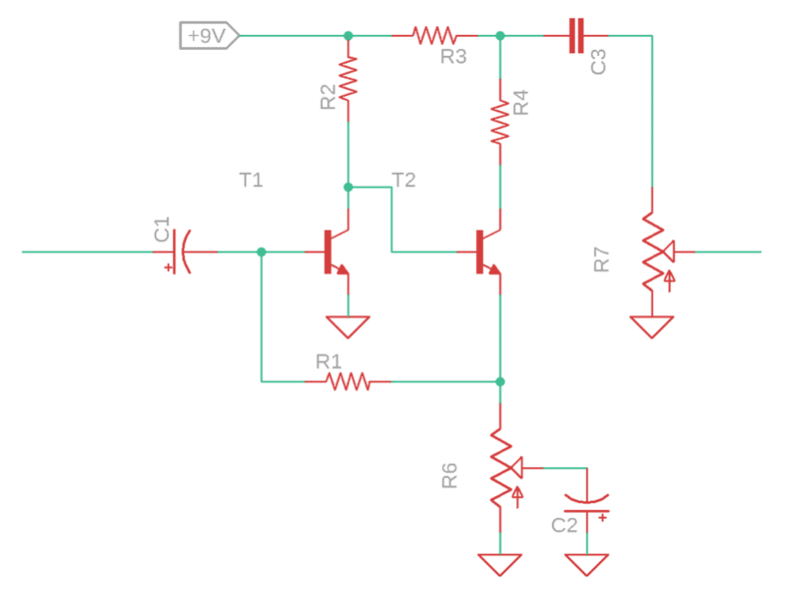 The resistance-capacitor couples form high-pass and low-pass filters. R1-C1 is a low pass filter that cuts the very high harmonics amplificated in the op-amp stage, that are harsh to the ear. 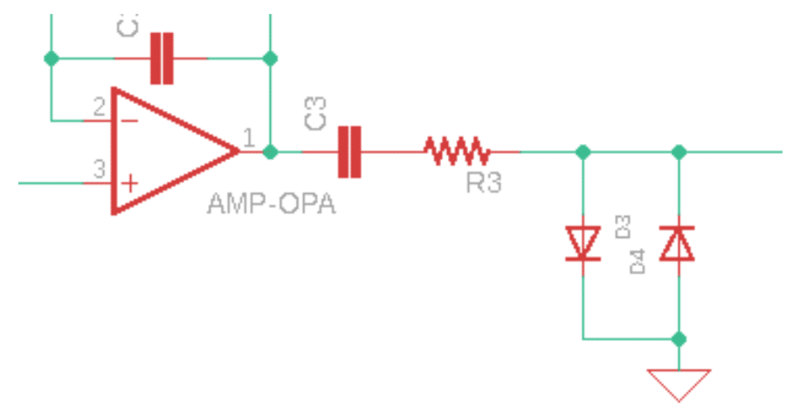 R2-C2 is a high pass filter that shapes the bandwidth of the amplification stage. It boosts everything above its cutoff frequency and progressively attenuates everything under it. This is where is the point : it amplifies the interesting frequencies and clean the ones you don’t want to hear, like the very low and very high ones. And, oh! This is exactly what we want from a Tube Screamer, a nice boost in the mids to get the guitar over the mix ! 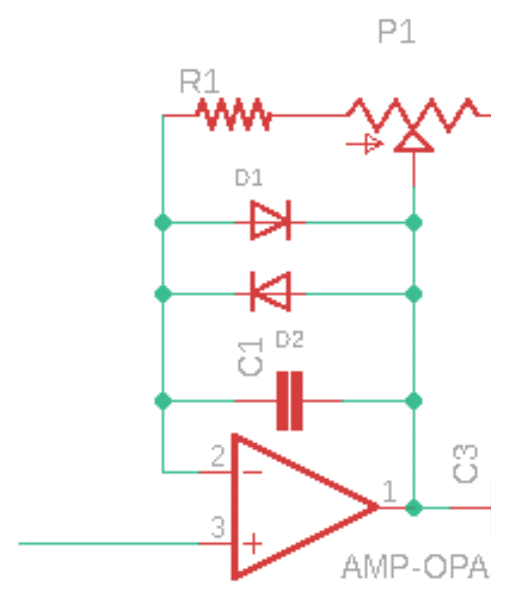 the R3-C3 couple also forms a high-pass filter but its cutoff frequency is very low, in order not to alter the signal. It’s here just to keep the signal clean from a DC component. A nice boost on mediums around 1 kHz, and the low and high frequencies get progressively attenuated. But we can notice that because of arbitrarily choosing the components values, the overall amplification is not very selective: the -3dB bandwidth is [300Hz; 3kHz] which is still acceptable for an overdrive pedal. If we’d choose to set the boost around mediums-highs frequencies, and to give a bit more presence in the lows, we would get a distortion pedal ! Fuzz pedal have a quite different mounting from OD and distortions. They were invented earlier and use transistors in their gain stage. The first op-amps arrived later. They have simpler structures with different impedance ranges and introduce the downside of noise. But then you get an amazing dynamic and sound ! To understand how they work, we’re going to study the fuzz face and big muff pi gain stages schematics. Here we have two transistors in common emitter configuration. It’s a typical mounting for this kind of transistors. Gain is given by the ratio of the resistors on the collector and emitter, and the potentiometer sets it. The freaky thing, is that when R6 potentiometer is at max value, gain is infinite! But as you may have guessed, it is physically impossible. The maximum gain the transistor can give is limited by its technical characteristics, which then works at its limit. The Big Muff PI schematics uses some principals we have already covered in the OD/Disto section. We have the clipping diodes in the feedback loop, and the gain stages stacking. The gain on each stage is not super high, the fuzz comes more from the from the stacking. For comparison, the Superfuzz has 5 transistors and the Fuzz War has 7! As explained, when the signal goes through the pedal it is submitted to a bunch of modifications (and we just saw the major ones). So to get an in depth view of this modifications, let’s dive into some temporal and frequential analysis. We tested 4 pedals, a boost/overdrive pedal, the Freq up from Anasounds (that’s us ! ), which is made with a Tube Screamer stage followed by a booster, 2 distortions, the boss DS-1 et MT-2, and a fuzz, the Feed Me from us too which was inspired by the Fuzz Face. 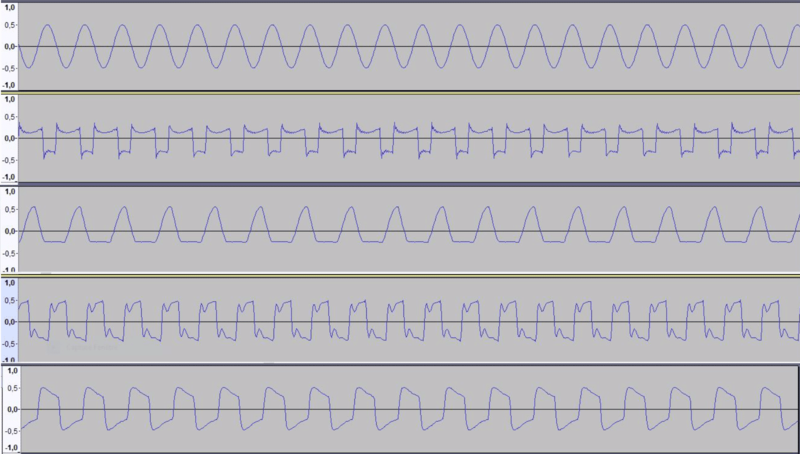 Our signal is a pure sinusoid of 1kHz, going through the pedals recorded on a processing software thanks to a sound card. First we have the pure sinusoid and the same one going through each pedal, with gain knob at 100%. From top to bottom : Boss DS-1, Anasounds Freq Up, Boss MT-2 and Anasounds Feed Me. We can see that the shape of the signal is changed. The more gain, the more the signal gets sharp-edged, the MT-2 and DS-1 distort the signal even more than the Feed Me ! How thin is the frontier? In the case of the boost/overdrive the signal is slightly crushed, but it’s not as big. Here we can perfectly see how the signal gets saturated, distorted and clipped. On this type of diagram, the lines represent the frequencies (that also are pure sinusoids) in the signal (abscissa) considering their amplitude (ordinate). As expected, we only have on line which is the 1kHz signal. To illustrate how the signal acts in front of the pedals, we can observe the spectrum of a 1kHz square signal. The analogy to a hardly clipped signal is very relevant. 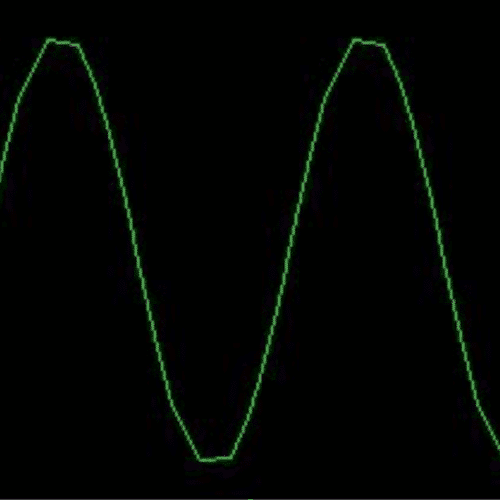 The square-shaped signal is actually composed of numerous sinusoids, the first and most important at 1kHz, and harmonics that stretch to infinite (not represented on this graph 🙂 ). All the frequencies get overlaid, the higher frequencies giving the edges to the signal. As we can see, when the signal goes through the pedals, a lot of new lines have appeared, and it looks much more like the square-shaped signal. All these harmonics are multiples of the fundamental (2*1kHz, 3*1kHz… N*1kHz). the “slicks” on the DS-1 and Feed Me are parasitic frequencies also amplified. They are responsible of the noise in the signal when the pots are cranked. These high frequency harmonics already were in the signal, as they are octaves of the same frequency, but their ratio to each others and amplitudes have been modified during amplification. It’s quite difficult to draw conclusions from this type of graph and analysis, cause the signal produced by a guitar is much more complex than a simple sinusoid. But at least we can figure out how harmonics structure the sound. After this long, and at the same time short analysis (if you want to get really deep into the subject a thesis might do it), we finally give you the tools to analyse and understand your sound and what effect suits you better between overdrive, distortion, and fuzz. There are a lot of other approaches to this subject, but the electronic one permits to understand the technologic choices that differentiate each effect. It is categoric but request a good level of knowledges to master the schematics. 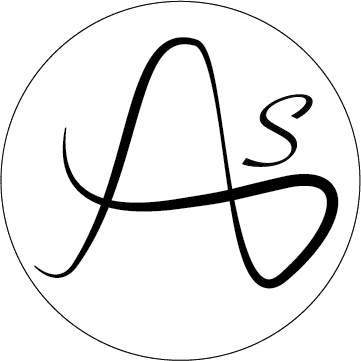 The technical principles have remain the same since the first innovations, but some interesting and more modern solutions have emerged, that might be the subject of another article! Temporal analysis seems to be the clearest approach, cause we can see what happens to the sinus. But we must not forget that our filters and amplifiers act differently to the frequencies injected and that the guitar creates a signal which is very different from what we worked on. The benefit of the frequential analysis is that it’s easy to do at home using a sound card. It permits to obtain a good sound knowledge and to test your own pedals! I hope you enjoyed this first article and that it brightened you on the thin frontiers to go from overdrive, to distortion, to fuzz. If there’s anything that is not clear to you, you can leave a comment and we’ll be glad to answer it. Same if you have suggestions, complementary informations, or questions we can answer, let us know! Posted in tech and tagged clipping, disto, Fuzz, od, saturation. Older →discover the new extended savage ! Brilliant article. Really interesting ! Thank you so much Ben ! Very interesting article! Appreciated by the guitar player / signal processing aficionado that I am. Can’t wait for a new article! Always a pleasure 🙂 Thank you Guillaume ! Si tu es français n’oublies pas qu’il y a toujours une version en FR également.